Lot Detail - Mario Lemieux's 1991-92 Pittsburgh Penguins Signed Koho Revolution Game-Used Stick - Art Ross and Conn Smythe Trophies Season! 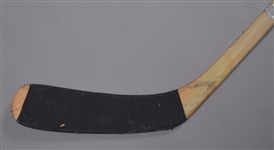 Mario Lemieux's 1991-92 Pittsburgh Penguins Signed Koho Revolution Game-Used Stick - Art Ross and Conn Smythe Trophies Season! 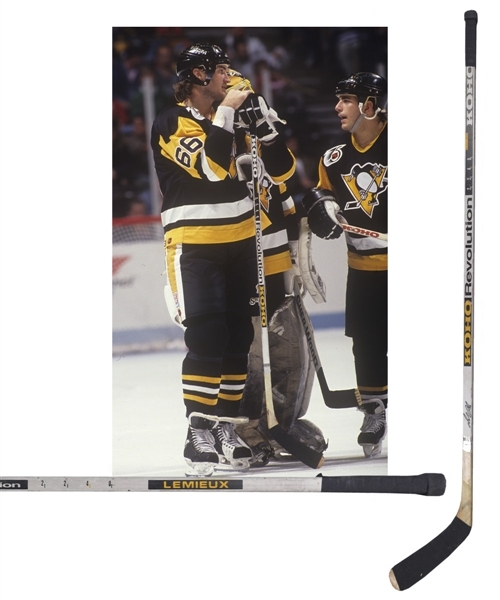 Mario Lemieux capped his fabulous 131-point Art Ross Trophy 1991-92 season by leading the Pittsburgh Penguins to their second straight Stanley Cup championship, joining fellow HOFer Bernie Parent as the only players to win the Conn Smythe Trophy in consecutive years. 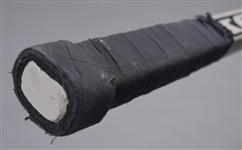 Super Mario signed in bold black marker low on the shaft of his white Koho Revolution 2240 model game-used stick from the 1991-92 season, which has his original tape jobs on the knob and blade and no cracking or damage. “Lemieux” factory graphics are high on the front of the shaft below the knob. Factory batch/pattern code "297" is stamped on back of shaft. Game wear includes red goalpost paint transfer on the middle of the shaft!